The hashtag marked a collection of statements from women who had been in abusive relationships explaining why they did not leave their significant others. The point of the trend was to counter the unfortunate narrative holding that Ray Rice’s wife was somehow responsible for the incident that got him fired yesterday. 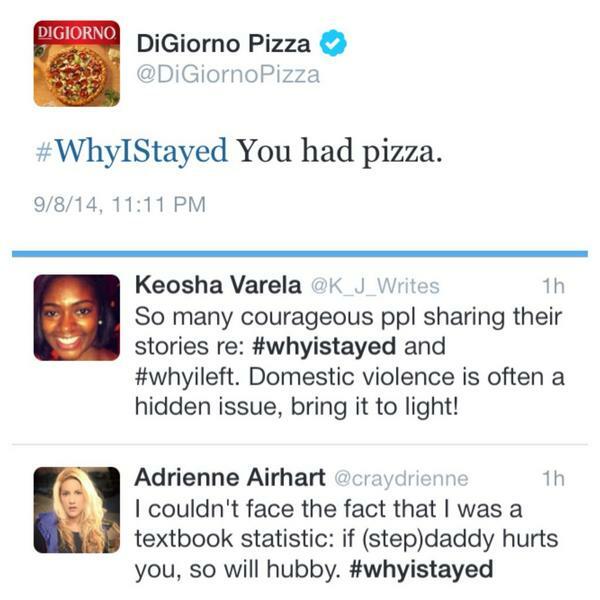 DiGiorno rightfully got a lot of very negative attention for a painfully insensitive message, but the brand’s social media manager also did a very thorough job of apologizing after the jump. A million apologies. Did not read what the hashtag was about before posting. That’s the official statement, but you may notice that the feed hasn’t tweeted any promotional messages today: since 11:15 last night, it’s been all apologies for the poorly planned message. @mstory123 Mark, pls understand this was not intentional. I didn’t research the hashtag before posting. An avoidable and colossal mistake. @laurenonizzle @dailydot I’m sorry Lauren. It was stupid, and there is no excuse for entering a conversation without knowing what its about. At the same time, we shouldn’t really be surprised. Some context: in late 2013, DiGiorno’s brand manager explained to AdAge that the company works with its AOR, Resource, to create its signature sense of spontaneity. He noted that the Sound of Music live-tweets that earned so much media were not planned. Our take: yes, the tweet was extremely unfortunate. Yes, a simple click on the hashtag would have revealed it to be a big no-no. Yet this is the sort of thing that happens when teams are pressured to come up with a brand response to every trending topic. Here’s what the social media manager did: responded to the tag, realized the tweet was inappropriate, and spent the next 12-plus hours apologizing for it. Can we honestly think of a better way to respond to this crisis? At what point should DiGiorno return to pizza as usual?